Folding one's own work is usually instructive and can lead to useful modifications and sometimes new works. After folding some Double Triangle Boxes for some friends I discovered that a folding modification allowed it to be shipped flat and reconstructed within seconds at the other end. The process also improved the accuracy of folding the triangle points. A further modification was the insertion of an optional "floor". This strengthens the model, allows it to lie very flat a nd makes the box erection process a lot more obvious to the receiver. 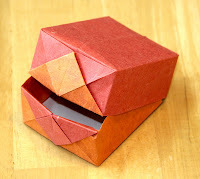 This is a relatively easy and sturdy little box which can be folded from almost any sized rectangle. The ones shown here are folded from American Letter sized sheets of dual sided kozo. The pack-it version fits in a small standard sized envelope.